Nick Earl got his start playing guitar at the age of 14 when he picked up his dad’s just to “try it out.” Years later, he eventually left his studies in architecture at Louisiana State University to pursue a degree in music at University of North Texas. Since his move to Texas Nick has played with several local artists, including Paul Slavens, Salim Nourallah, Gabrielle La Plante, Deathray Davies, Vanessa Peters and The Travoltas. He currently tours frequently with The Polyphonic Spree and Telegraph Canyon. 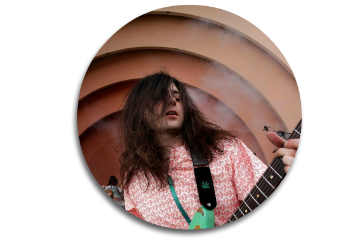 Nick is a two time nominee for the Dallas Observer Music Awards for Best Guitarist. Nick also enjoys expanding his musical vocabulary through composition with his own trio, aptly named Nick Earl Trio. A recent collaboration with Contemporary Ballet Dallas resulted in Nick’s re-imagined version of Igor Stravinsky’s Firebird, a fully staged contemporary ballet which debuted in Spring of 2015. When not touring and composing, Nick enjoys teaching with Strout Studios and Choreo Records Youth Ensemble. He is also an accomplished artist and spends a good deal of time at his desk inking portraits. Nick lives in Dallas with his wife, local singer and actress Natalie Young Earl. Nick’s original compositions and samples of his artwork can be viewed online at nickearlonline.com.